I just walked away from my Madonna, a winter image bathed in purples and golden greens. The painting was at that stage where I still had a couple of hours before it’s completed. It’s an instinctual thing, a creative hunch. It usually comes in the late afternoon, a time when I head into the kitchen, open my fridge and figure out what to make for dinner. I’m at a point in my life when vanilla ice cream has been replaced by Brussels sprouts. Good diet advice: Your body can handle only so many Brussels sprouts. With vanilla ice cream, it’s endless. My culinary adventure suddenly was interrupted by a friendly voice at the door. Helen Leung introduced herself as Hollywood field deputy for Councilman Eric Garcetti, a second-generation Angeleno politician. She handed me a green flier. Roll up your sleeves and get your hands dirty! Fountain Avenue Community Garden Planning Meeting. Join us for the first community meeting to discuss plans to build a new community garden in your neighborhood, located at the southwest corner of Fountain Avenue & St. Andrews Place. 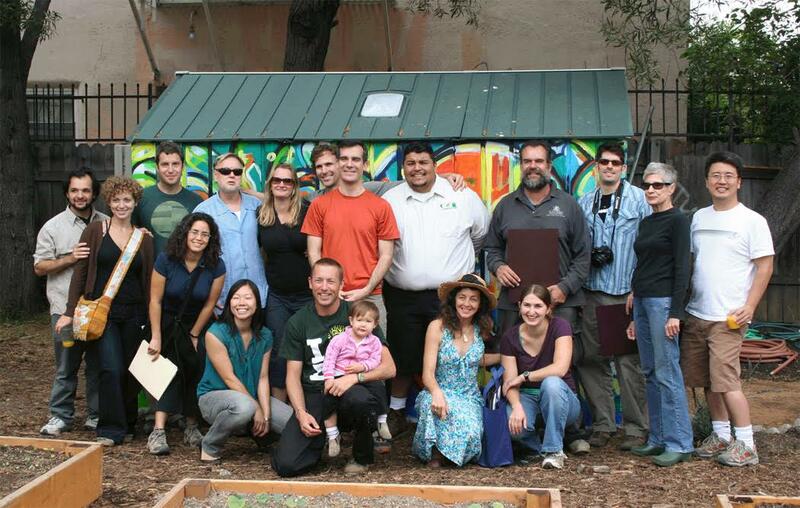 This opportunity to be part of Fountain Community Gardens presented itself during another transition in my life. I’ve lived most of my adult life across the street from the garden. My Russian-Slavic family bought a Hollywood duplex cozied up to the Hollywood Freeway and shadowed by Holy Transfiguration Russian Orthodox Church. I remember the plot of land when it was used as a homeless shelter space populated with trailers that eventually caught fire and had to be demolished. The vacant lot was originally planned as a community center and park, but funding was not fully identified in a city and state that was on the brink of bankruptcy. So in the interim the lot would be turned into a community garden. 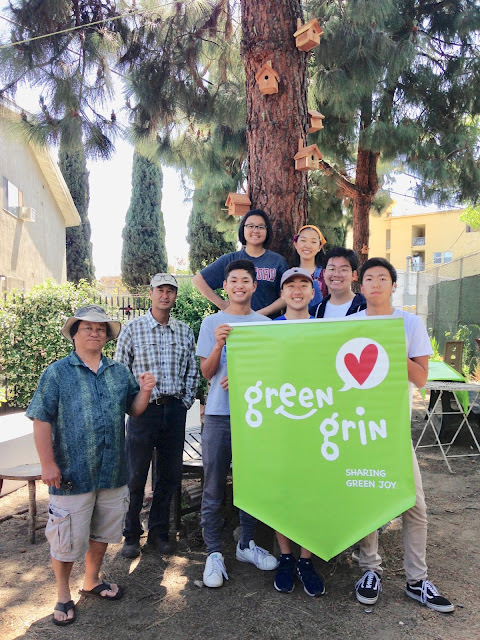 Steve Anderson with the LA Conservation Corps, working with at-risk kids who are trained to become gardeners, and the Los Angeles Community Garden Council would head the design, construction and organizational logistics of Hollywood’s newest green space. This new garden would be the third one on this avenue, making Fountain the street with the most community gardens in L.A. The garden was scheduled to open in March of 2009. At the inaugural meeting, 35 adults and five children attended. It was a cultural mix of Mexican and Central Americans, Anglos, a few Asians and one African-American. The mood in the meeting was friendly and enthusiastic. In a time when technology has minimized human contact, having a community garden lessens that isolation. Nine years later, Fountain Community Gardens has given us an opportunity to reach out and nurture new friendships and learn new things about the community that surrounds these beds. What strikes each member and visitor is an overwhelming wash of greens and earth tones in the middle of concrete, graffiti and freeways. As you enter, a certain calmness and wonderment spreads across the face softened by a wide smile. I believe that this has become a community center built with green walls that will grow and take shape as we all get to know one another. A patch of soil, any size any shape, worn or fertile, waiting for patient hands to toil and plant. A space when minutes turn into hours, while a chorus of pestering repetitive thoughts succumb to the physical sensation of hands buried in dark moist soil.A space where we learn to grow our own food, share the abundance of the harvest with one another and our community. I welcome you to these patches of soil that wait for patient hands to toil and plant. So now it is up to you guys to look at your beds and figure out your future recipes to be shared with the rest of us. Enjoy!